Sell My Car Milton Keynes. WeWantAnyCar.com Offer Quick Car Sale. Milton Keynes is one of the UK’s newest towns having only been designated as a district in 1967. However, the art of selling your car is not quite as recent a concept though; if you need to raise capital by selling your car then the used car market has been your main solution for generations. Finalise the deal – If everything is in place and both parties are happy with the deal after a final check then we will shake hands and have the money in your account. Milton Keynes is a transport hub, so you won’t find it hard to find our MK office, which is neatly situated between the A5 and M1. 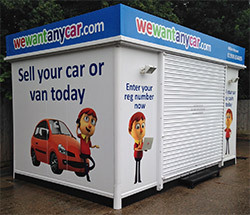 To book an appointment call Lee on 01908 854405 on email us at miltonkeynes@wewantanycar.com or pop into the office. Excellent fast and efficient service, at the Milton Keynes branch. Friendly quick service. Went over the paperwork, the man then went gave the car a quick check. Came back said all was fine, exchanged bank details. 4 days later said sum was in account. Easy and at a fair price. Sure I would of got more money going privately but this was so quick and easy would definitely use them again. Also beat the competitor of the similar name by approximately £200. Liked that I got to talk to someone. Happy with the price, Paul our contact, was fair nice and respectful the whole time. I dod sell a car with a competitor and really disliked the way they chipped (offered a higher price and then reduced it for this that and the other, which really should have been expected). Had been looking to sell my trusted 1 series for some weeks. Tried privately but only a couple callers asking my min price but nothing more. Tried valuations from a few sites & even had a valuer come over for a thorough hour long assessment. At the end of that I was offered almost 20% less than WeWant paid (and this was £50 more than the WeBuy top whack quote) Drove 20 miles to MK, saw Lee who did a quick check that caught all the issues and within about 10 minutes I'd agreed to price offered. Happy days. May have got more pursuing a private sale in the long run, but what's the point of having uncertainty when it would sell and not knowing how much advertising cost would be needed. We Want Any Car provided an excellent service. It was the first time I had used this option for sale of a vehicle and found the process to be simple and straight forward. Appointments were made easily and the branch were very professional in their approach to making arrangements for purchase. The process was explained clearly and I was kept informed throughout. My only criticism would be that initial valuation figure provided when making initial enquiry was far in excess of the actual realistic valuation for the vehicle. As I had researched market value beforehand this was not a problem to me, but would potentially be to others as could be deemed misleading the customer. Overall however the process was painless and will no doubt use We Want Any Car again in future. Impressed with the service we received. Would recommend trying to anyone with a car to sell. Straightforward process - friendly and efficient service - funds were received exactly as planned.